When businesses do things that harm workers, the environment, or the health and safety of their consumers, we are justifiably outraged. But do the companies deserve all the blame? In fact, our buying habits can actually drive companies to focus more on maximizing profits and less on making conscientious business decisions in order to remain competitive in the marketplace. When our shopping behavior rewards unethical business practices, the blame game becomes a lot less clear-cut. Here are three ways customers may unwittingly foster unethical business practices. Low costs to consumers sometimes come at a cost. 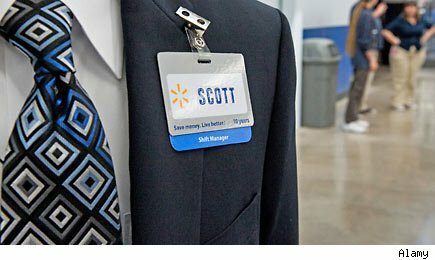 Walmart's (WMT) deep discounting strategy partially relies on its ability to minimize the cost of employee compensation. In fact, Walmart founder Sam Walton has been quoted as saying, "I pay low wages. I can take advantage of that. We're going to be successful, but the basis is a very low-wage, low-benefit model of employment." How low are we talking? The average pay for "associates" is less than $12 per hour, which adds up to annual pay that is below the poverty line for a family of four. The company also does not provide health insurance plans to all of its employees -- and those who are covered have to pay a large percentage of their yearly pay in premiums and deductibles. Consumers who put price first risk increasing the competitive advantage of businesses that fail to reinvest in the well-being of their employees, at the expense of supporting businesses that will not make such compromises. As consumers, we are drawn to food that looks fresh and healthy. The problem is that our beliefs about how food shouldlook are sometimes misguided. We want our poultry colored a light shade of pink, believing that the hue signifies freshness. However, one of the ways poultry businesses achieve that color is by routinely feeding arsenic to their animals. While it's not clear that the levels of arsenic remaining in our food harm us, this example illuminates how our expectations can lead us to make purchasing decisions that do not reflect our underlying desires. Consider also our attraction to unblemished fruits and vegetables. In order to achieve that look without dramatically increasing labor costs (that are passed on to the consumer), farmers use pesticides to reduce pests' attacks on their crops. Some of these chemicals remain in our fruits and vegetables even after thorough washing. Peaches are especially vulnerable to pesticide retention, and some scientists worry that even low-level pesticide exposure can be dangerous to humans. Aside from inspiring us to make purchasing decisions dangerous to our own health, our expectations about how food should look also contribute to massive waste, as food sellers throw away perfectly healthy food that consumers will not buy. It's easy to overlook the larger implications of each item in your shopping cart when you're standing in the checkout line. But failing to consider broader consequences of big purchases can lead to choices that have a significant, long-term negative impact on the world. For example, in our haste to replace appliances, complete home improvement projects, or purchase new vehicles, we sometimes forget to consider how energy-efficient products can protect the environment while offering long-term cost savings. This lowers the incentive for businesses to develop and sell more environmentally sustainable alternatives. Consumers can encourage and support businesses to clean up their acts. First, and most importantly, you can reward ethical companies with your business. Pay attention to whether the companies you shop at engage in activities you endorse. For example, if you think employees should have health insurance, for example, that should make you feel a little better about paying a premium for your Starbucks (SBUX) beverage. If you want to minimize the amount of pesticide residue you ingest, consider turning to Whole Foods (WFM) or other stores offering organic produce. Second, make concrete demands. If you are concerned that a company's practices violate the rights of consumers or other stakeholders, voice your concerns. If they fail to act on your concerns, you can put pressure on them by publicly exposing their harmful business practices to other consumers. How do your beliefs affect your consuming habits? Chime in below. Motley Fool contributor M. Joy Hayes, Ph.D. is the Principal at ethics consulting firm Courageous Ethics. She doesn't own shares of any of the companies mentioned. Follow @JoyofEthics on Twitter. The Motley Fool owns shares of Starbucks and Whole Foods. Motley Fool newsletter services have recommended buying shares of Whole Foods and Starbucks, as well as creating a diagonal call position in Wal-Mart and writing covered calls on Starbucks.